I would recommend this watch. Well sized - substantial without making you look like you aspire to appear on the NFL draft show. Dial is easy to read even in low light conditions. Strap and buckle are substantial. 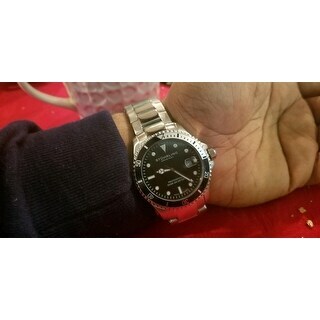 The watch is comparable to high price brands that would cost several thousand dollars. I have several other Stuhrling watches and have not had any problems with any of them. The Regatta Elite is a member of the Regatta Family, which includes timepieces designed to take you into the depths of the ocean and back. This incredible watch was built tough, featuring a solid stainless steel case, a unidirectional ratcheting bezel, and a fully integrated solid stainless steel link bracelet. It is equipped with a Ronda 515 Swiss quartz movement for accuracy and reliability. Most important of all, the Regatta Elite is tested to be a professional diver, offering up to 200 meters water resistance. Most men's watch bands can be sized to fit 7.5 to 8.5-inch wrists. Great watch, exceptional value.The quality of this watch is unmatched for the price..Crystal face, quartz movement, luminous dial, water proof, stainless steel case, attractive steel clasp band..Buy it. I absolutely love this watch, it looks almost exactly like it does in the picture and the band is incredibly comfortable. The band is a little bit big but that’s easy enough to have fixed. I’ve also hit the dial on quite a few surfaces and not a scratch yet. I highly recommend this great watch! I purchased the elite divers watch that is rated at 200 meters. Mine leaked and is ruined after a trip of one meter and there is no 2 year warranty unless you buy it. 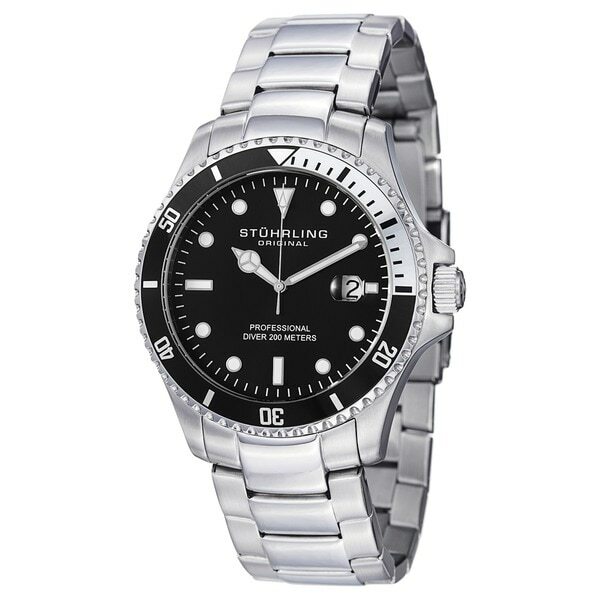 I am very unhappy with this watch and will never buy anything from stuhrling again. I am re-evaluating the watch after receiving it with a dead battery. The watch is now working very well. The only thing I have noticed is that the illumination of the hands and numbers is not as bright as I would like. Other than that, I am very happy with this purchase. Over all it's a nice looking watch. My husband was so excited when i surprised him with this incredible watch! After many years his old one needed to be replaced. It was built tough, accurate, reliable and water resistant. He loves snorkeling. Don't bother! Crystal cracked less than a week after receipt. Since I purchased the "Platinum Protection Plan" (a complete joke), the manufacturer's warranty is no good. The third party who administers the plan tells me that it could take up to 60 days to complete the repair. Had I known this, I would've spent a few extra dollars and bought it from ***, where I would've simply returned it to them and had a new one by now. I'll NEVER buy another thing from Overstock. Gorgeous looking watch, it shines and its also affordable which is why its caught my eye. its one of those watches that i can later passdown to my son. My son loves his watch. It looks just as good as the more expensive watches that my husband has. It was a great choice. It is very sturdy and stands up to all the abuse my son puts it through! I'm giving it a 4 star because I wont know how well it works until I give it to my son for christmas, but I love the feel of it and it came in a very nice box, so I'm hoping it will be a good watch for him. I will update my review when he wears it. Update my son loved it! "Is the watch water proof and to what depth?" Manufacturer claims 200m. It does have a screw-down crown and back, so the watch itself does have what you'd find from a proper diver watch. "Does this watch have a luminous hands and face? Does the bezel rotate?" I found the details and spec sections. "How to start to run？"
I think it came with a piece of plastic keeping the little knob on the side from being pressed in all the way. The watch does come with directions. It's a beautiful watch. My husband wears it every day! "Can you make it tighter on your wrist"
We recommend taking it to a professional jeweler so that they can remove some links. Yes. You need to have a jeweler do it or buy the little tool that you can buy online for a buck or two and do it yourself. "How do I remove some links on the metal dive watch bands? It looks like there are 6 on each side that are adjustable. Can I do it odors otneed to be done at a jeweler? Thanks "
We took ours to a jeweler. It only cost $5.00 to have them removed. I had the band Adjusted at a Jeweler.